Hello everyone, hope all the Beta's are now happily out of hibernation and thrashing around. As ever even after a relatively pampered lay up the little jobs (rad switch wiring, perished 18 yr old fuel return line from tank, sticky brakes, wobbly shock etc) all sorted and looking forward to "summer"... lets hope! Where/when does anyone fancy our annual meet? Is there any events we could tag onto etc? Also is it just me..., I know I'm useless with computerisation machines but does our donations page not work? Wasn't Darren offering to organise this year? It’s always tricky knowing where to start. The way I did it was to suggest dates I could do and then work from there. Good luck if you fancy a go. July, August or September sound good to me, apart from the middle of August now booked for our family hols. Could work having two weekends in different parts of the country ? I will speak to them this weekend, to see if there is any further progress. For me, I wouldn’t be too worried about going to an ‘event’ other than tagging onto a car show that has worked well in previous years. It’s just one more thing to try to coordinate. I will try to go wherever we choose, or even 2. With our usual ineptitude we have nothing booked yet for holidays so don’t wait for me ! Good luck to whoever takes up the role- we really enjoyed doing it last year. Darren, any of those dates sound good to me, Devon &/or Northamptonshire. I could be wrong but my guess is by the possibility of having two "events" it could give twice the opportunities for peoples diary's to clash! She will post full details soon, in a new post. Darren if you are still happy to still run the Northamptonshire Meeta, that would be great. I think it will work well, for members North of Birmingham, Somerset/Devon will be a fair trek. Potential mini meet in Cleethorpes then 藍 at least two Beta nuts local to there. I'm booked to attend the festival of the Unexceptional in the Trevi so will definitely be up for a Beta meet then even if I've already committed to the South-west meet in Devon on the 8th. "Have Trevi will travel"
I won't be able to make the 15th of july unfortunately, I don't think the other half would be too impressed on her birthday, she tolerates enough as it is... but should be good for other dates. 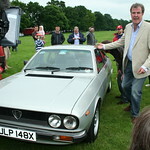 Hopefully be able to drag the HPE out for it, if not hope to be in a Lancia regardless. I like the Northampton idea and the dates are fine for me.